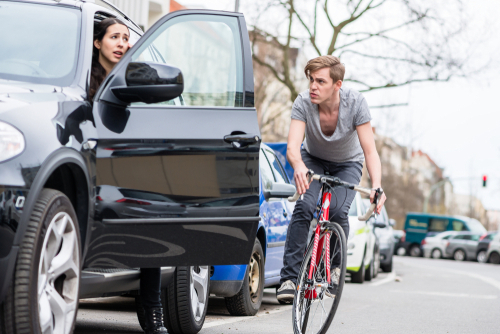 It may sound like the beginning of a comedy movie, but cyclists collide with parked car doors more often than you’d think. When this does happen, the biker is often seriously injured from the crash, and the car driver is usually held legally liable. Read on to learn more about these “dooring” accidents. “Dooring” is a term that describes an accident between a passing cyclist and a parked car or truck. The parked vehicle often opens their door unexpectedly, which results in a collision. Nationwide statistics on this issue are not readily available, but some research has been done in Chicago. In 2015, more than 300 cyclists reported crashing into a car door. Most dooring accidents are caused by the driver of the parked vehicle. In most situations, the driver fails to see the cyclist coming because they never check for incoming traffic. These situations are much more likely to occur in urban environments. While it’s not ideal, cyclists may prefer to move to the left-hand side of their lane when they are passing lanes of parked traffic. This will put you closer to moving traffic, but it can also put you out of harm’s way in the event someone opens their door. It’s almost impossible to predict when a parked driver may open their door. Who is Liable in a Dooring Accident? In most circumstances, the driver of the vehicle will be held liable for a dooring accident. When the cyclist is riding in a legal lane of traffic, then they have the right of way. The situation would be no different than if the parked vehicle’s door caused a collision with a moving car traveling in their lane of traffic. The injured cyclist would need to pursue a personal injury lawsuit against the negligent driver to obtain compensation for their losses. Did you or a loved one sustain serious injuries as a result of a bicycle accident in Florida? Don’t let the medical bills pile up while you wait for the negligent party or their insurance company to do the right thing. Right now, you need an aggressive personal injury attorney on your side, fighting to get you the compensation you need, want, and deserve. The skilled attorneys at Lawlor, White & Murphey represent clients injured in Fort Lauderdale, Pembroke Pines, Plantation, Pompano Beach and throughout Florida. Contact us by calling 954-525-2345 or email us to schedule a free consultation about your case. We have an office conveniently located at 2211 Davie Boulevard, Fort Lauderdale, Florida.